Sadly, often overlooked. May not be the deepest games, but many are quite fun! Play wise, I have always enjoyed Mousin' Around very much. I own 3 of the games by Ward. but i have a fondness for BMX. Sorry for Ward but he peaked right out of the gate. BMX and Mousin' Around are good games, I agree. But Fathom, even without the art package, is a great game. All of the drop targets, the inline targets, the spinner, just a great design. Even non-pinheads enjoy that game. Maybe some of us would have given Mousin Around a few more plays if it had a better art package too? 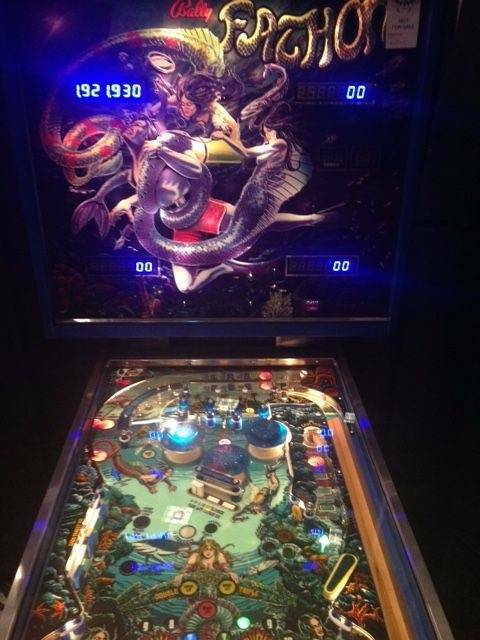 Fathom is an all-time Top 5 pin for me. Who names their kid Ward? Now a Chicago firefighter. His parents and sister all worked at Bally on Belmont Avenue in Chicago. His late Dad's name was Warren. Parents chose these names in the 1950's. Could they have been influenced by the show "Leave it to Beaver"? Fathom all day long. That game just keeps on giving. Mousin' Around is a decent deck, but needs a serious revision to the ruleset to keep the ramp in the center from dominating the game. I guess in some tourneys, they disable the ramp and the game balances out quite nicely. Hardbody is an incredibly underrated deck. Considering what there is to do on this deck, if you can find one for a good price and deal with the grfx package, consider it after a game or 3. I need to spend some serious time on Goldeneye before I'll make a real judgment about it. But I know of some players that I respect who think it's one of the better Sega titles. Overall, I'd say Ward was a decent designer who had 1 great game. Now I gotta find me a Fathom! Bumping 3 year old thread. Because Ward Pemberton. Is he still around? What's he doing now? Love some Fathom! Played this restored beauty at TPF last weekend. Played more of this game then anything else at the show. This picture was the highest score I was able to achieve. I'm curious what entails a designer's job. After listening to Trudeau's interview on the Flippin' Podcast, it sounded like he only did the layout of the table and moves on to the next project which means he doesn't influence art or rules. Of course this may vary by designer but are we giving to much credit to the designer? Is it more a cumulative effort between the artist, designer and programmer? If this is true, would the best way to judge a designer's work be how well a game shoots and try to not look at the art or rules? I believe different designers contribute in their own ways with art and programming. GI has to have THE best toy ever. revolving island is awesome. Is he working for HOMEPIN? I loved Mousin and Goldeneye, which I owned both at one time. Fathom is obviously brilliant, and is probably the best early Bally game out there in my book. I've always wanted to own GI even though people give it a hard time. I've always really enjoyed playing it. Seems like he did a lot of real inventive stuff. mousin around. tied with fathom. Fathom has been a favorite of mine since WAAYback. This time around, I started my collection with known Ritchie titles- Black Knight, Firepower, and Big Guns (Technically a Ritchie Game , and, I have/have had a couple Kimek Games too- Old Chicago, Amigo, and Spy Hunter. I had Never heard of Pemberton before. r, but then I got a Mousin' around. I Still didn't realize who it was until after I got it home, and wondered who created this crazy game. Last week I got a Riverboat Gambler, and now I'm a Ritchie/Pemberton man! Sort of the way people used to be a Marlboro man. Sorry Greg, but your designs - with the exception of the OC, CF, and Xenon, weren't my cup of tea. Big fan of Mousin Around. Always likened Mr. Pemberton's designs to Dennis Nordman's. Really off-the-wall and unique, with splashes of the familiar. Mr. Pemberton is a really personable guy. Like everyone in the pinball industry, he's always got time to chew the fat about pinball days gone by.